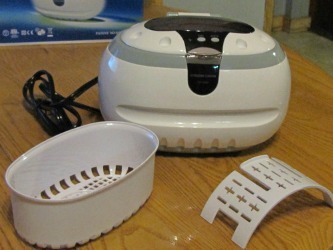 Susan shared her Sonic Wave jewelry cleaner review with me, which is a brand of personal and home use ultrasonic cleaning machine. Before purchasing this product I had no experience with any machine-type jewelry cleaners, so I wasn't sure what to expect. When I first got it I used jewelry that was visibly dirty just to see the results that this machine would have. After the three minute cycle, this is the only cycle that the machine offers, I could tell that the jewelry looked much shinier and more polished. It wasn't perfect, but I was impressed. I've found that running the jewelry through a second, or even third cycle is what it takes to really clean the jewelry to perfection. This machine is perfect for jewelry that is hard to polish by hand like necklaces, for instance. Unlike some rings that I have which are fairly smooth and can be hand-polished, cleaning necklaces is harder because of the number of individual links or pieces that it has. That is why this ultrasonic machine is so handy. It gets into all of the little crevices that are otherwise hard to reach. Overall, I am happy with my purchase, and it was well worth the money. I've used it to clean a sterling silver ring, titanium ring, gold ring, sterling silver necklace with diamond pendant, and even my eyeglasses, and been happy with how it worked for all of them. Thanks for this review Susan. This is a very popular brand on Amazon.com, with lots of reviews, and still gets a four star rating. I would love to hear from even more people who've used it, sharing their opinions and experiences with it. 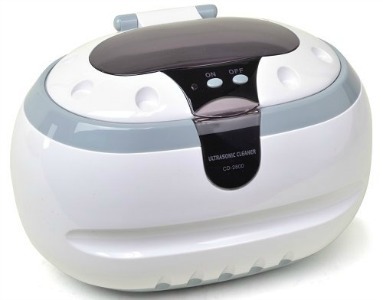 You can share your reviews here of this or any other brand of ultrasonic cleaning machine, sharing how they worked for you, or read other reviews of other brands already submitted.